(...) Finland's most significant composer after Sibelius at his most mature and characteristic. (...) this new Ondine (recording) boasts wonderful performances and vivid recorded sound. (The Fourth Symphony) gets the adrenalin rushing and the tears flowing. It's a masterful piece of writing which, along with the Cello Concerto, makes this a must-have disc. 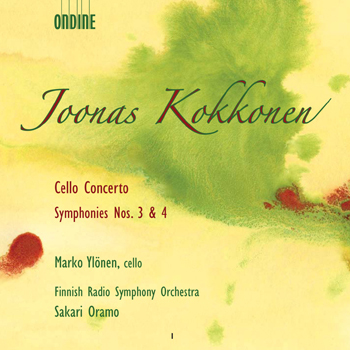 Kokkonen's three finest orchestral scores in superlative readings. The incorruptable Finnish RSO performs (...) with such an implicitness and dedication, as if the music was a Beethoven Symphony. It couldn't be bettered. This emotionally and technically utterly dense and finely honed music could not sound more strikingly powerful and coloured than here. Oramo and his musicians deliver a sublime rendition. Kokkonen deserves better international recognition than he has hitherto received. (...) His Cello Concerto, stylistically somewhere between Shostakovich and Walton, is a masterpiece of craft and lyricism: that is certainly the impression given by Marko Ylönen with the Finnish Radio Symphony Orchestra. This terrific disc belongs in every serious collection. This disc features major works of Finnish composer Joonas Kokkonen (1921-1996) - the dominating figure in post-war Finnish music after the death of Jean Sibelius in 1957. It is the first volume of two releases featuring the complete symphonies, as well as Cello Concerto and Opus sonorum. The featured works were written between 1967 and 1971 during the composer's late "neo-Romantic" period of free tonality. Kokkonen linked himself to the symphonic tradition of Brahms and Sibelius. The Cello Concerto, with its profound central Adagio movement, is a gem in concerto literature and probably the most-performed cello concerto by any Finnish composer. It features soloist Marko Ylönen, who specializes in contemporary repertoire. Previous recordings with chief conductor Sakari Oramo and the Finnish Radio Symphony Orchestra include a Lindberg disc (ODE 1038-2) which won both a Classic FM Gramophone Award and a BBC Music Magazine Award in 2006 (Best Contemporary / Best Première).